running a Discordapp chat server for your guild or forums? then this is perfect for you. this block can display who is online in your server. 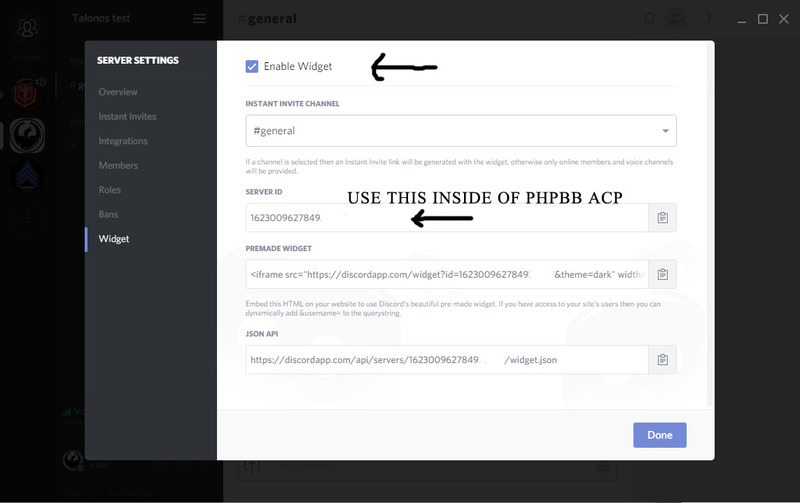 to enable the block to work you must enable "widget" within the discord server settings section within the discord app and input the "Server id" given on that same page into the ACP. Addon Requirements: Board3 Portal 2.1 and newer. 2. navigate to Extensions -> Portal -> Portal Modules and click "Add Module" for any side column and add Discord. 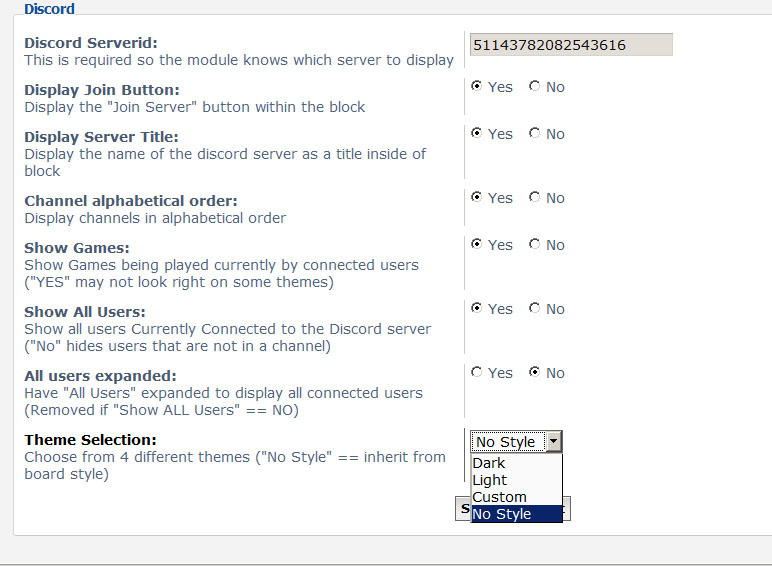 3. now configure your installed "Discord" module to your liking by clicking on the . added ACP option "update time in minutes"
if they not showing there you must be installing them wrong. theres an extension called "boardtools" which you can use to upload extensions directly from the ACP and it will verify and install in the right folders for you. heres a link to it it. if you install that then upload the zip files you download via the extension they will all work properly. ok thanks i will give it a try ,this is what my ext folder looks like http://prntscr.com/bol46x have i done it wrong ? yes thats wrong. the "b3p" folders should be inside of the "talonos" folder. once you have it like that they will show up in the ACP. This works great, thanks a lot! The only problem I have found so far, is that when vieiwng through mobile, the widget does not display when viewing vertically, but works perfectly when viewed horizonally. I have tested this on a couple differnet phones with the same result. Any idea on how I may go about fixing this? Again, great work and greatly appreciated! Pestilent wrote: This works great, thanks a lot! it must have something to do with responsive-hide which i don't have set in discord. tomorrow i'll be releasing a new version which actually has collaspable categories capabilities which may fix you issue. That would be amazing. Thanks again. Is there any way to remove the "Channels" and just have it display the "Online Users"? Last edited by Pestilent on December 3rd, 2016, 6:21 pm, edited 2 times in total.